How to choose a tennis racket is the focus of this page. The right tennis racket will help you to play better, and prevent/reduce injuries. When you choose a tennis racket consider the three broad categories of rackets: power (game improvement) rackets, mid power/control (‘Tweener) rackets and control (player’s) rackets. Power rackets: These are easy to use. They are generally light (8-9.5 ounces) for easy maneuverability, have a larger head (107-135 square inches) for more hitting area and power, stiff for more power and control, and balanced head heavy to have weight in the hitting zone for power. Overall they provide power and are forgiving for off center hits. They are for beginner-level players who do not generate enough power from their strokes. Control rackets: These rackets provide more control for advanced players who generate their own power from their swing. These are heavier (11.5-13+ ounces), have smaller heads (85-98 square inches), thinner, flexible, and head light. Mid power/control: These offer a blend of features between power rackets and control rackets. If you are a beginner or a mid level player look at the power and mid power/control rackets. If you are a mid level to advanced player look at the mid power/control rackets and the control rackets. 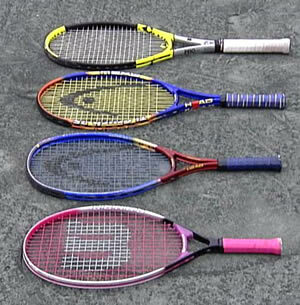 The best method of selecting a racket is to demo a few (say 5) rackets. You can select which rackets to demo according to your level of play using the above categorization. You can also consider other factors such as budget and preferred brands that your favorite pros use. You can usually get demo rackets from a shop that sells tennis rackets. When demoing the rackets try to play with each racket briefly so that you can compare them as accurately as possible. And try out each type of stroke as a racket that is good for say ground strokes, may not feel good for the serve. As an example for demoing rackets, hit ground strokes for 5mins each using a different racket. Then do the same for volleys and the serve. Keep in mind that you are not going to get ideal comparisons as the different demo rackets probably have different strings, string tensions, grips etc. Demoing a few rackets as stated above is the best and fastest way to choose a tennis racket. Below are some tennis rackets criteria you can consider for various reasons but you can over look if you take the above demo approach to select the racket. Larger heads provide more power. Larger heads provides a larger hitting area and sweet spot. Smaller heads provide more control. Most common head size is between 95-110 square inches. Generally smaller heads appeal to more accomplished players. Legal limit for tournament play is 27-29 inches. Standard rackets are 27 inches. Longer racket provides more reach on ground strokes, some leverage on the serve and a little more power overall. Most longer length rackets are lighter than their shorter version for maneuverability. In most cases we recommend that you go with a standard length racket of 27 inches unless you use two hands for both the forehand and backhand in which case you would want more reach. Marion Bartoli who uses two handed strokes on both sides uses a 29 inch racket. Heavier, head-light rackets: Preferred by most professionals and referred to as traditionally weighted rackets. Weigh about 11-13 ounces. Balanced 1/2 to 1-1/2 inches head light (ie the balance point is 1/2 to 1-1/2 inches towards the but from the center of the racket) for maneuverability. Provides control. Suitable for players who provide their own power from their swing and want good control form their racket. Lightweight, head-heavy rackets: The concept is that these rackets would provide more maneuverability without sacrificing power as they have weight in the head for power. Some people think that these rackets transfer more tension to the arm and do not feel solid. It is generally advisable to go with a heavier, head-light racket. A more stiff racket does not deplete as much energy from a ball as a less stiff racket and thus is more powerful. A stiff frame transfers more stress to the arm. So if you have injuries it makes sense to stay away from a stiff or very stiff racket. Generally less stiff rackets provide more spin as the ball stays more on the racket strings. If you are an advanced player you may want to stay away from a stiff frame as your long, powerful swing will provide too much power sending the ball out. But if you are a beginner or an intermediate player a stiff racket may be good as it would not deflect much and provide more control as well as power. There are two types of string patterns to consider when you choose a tennis racket: open and dense (or closed). With an open string pattern the strings are spaced more widely apart. So fewer strings strike the ball and the strings deflect more. This provides more power and less control. But you also get more spin. The down side is that the strings tend to move and cut each other resulting in strings breaking faster. The denser strings pattern provides the opposite of what you get form an open string pattern. In general, if you do not put much spin and want more control, or if you put heavy top spin and want more long lasting strings, go with a dense string pattern. So we recommend that in general you go with a dense string pattern when you choose a tennis racket.